[July 27, 2009] CAPE CANAVERAL, Fla. (AP) -- After a week-and-a-half together, astronauts aboard the linked shuttle and station are taking their last spacewalk. Christopher Cassidy and Thomas Marshburn ventured out Monday morning on the fifth and final spacewalk. They will rearrange some power cable hookups, fold down a piece of popped-up insulation on a small robot arm and install TV cameras on the brand new porch of the Japanese lab. Shuttle commander Mark Polansky says everyone will be careful, because "in my book, the last one you do is always the one that you have to watch out for the most." 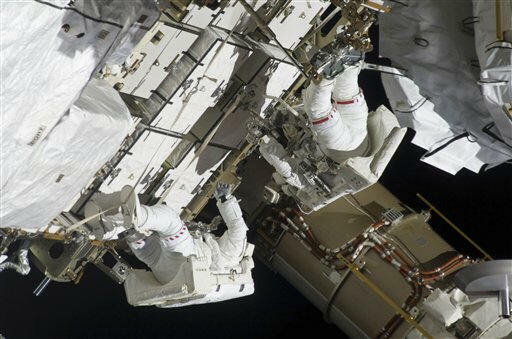 Endeavour will undock from the international space station Tuesday. The mission created the largest space gathering ever, with 13 people.